Now available on a Double CD -Poems about Durban - Featuring some of the world's great living poets. POETRY AFRICA IS ONE OF AFRICA'S GREATEST LITERATURE EVENTS. THIS ANNUAL WEEKLONG FESTIVAL, IN DURBAN SOUTH AFRICA, FEATURES POETS FROM A RICHLY DIVERSE RANGE OF COUNTRIES AND CULTURES. 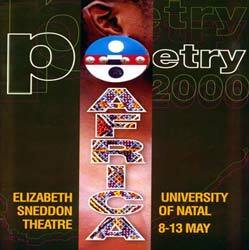 Poetry Africa 2000 IS PRESENTED BY THE CENTRE FOR CREATIVE ARTS, UNIVERSITY OF NATAL, DURBAN. All poets were requested to prepare a short poem for presentation on closing night, about their experiences in Durban. What you hear on this double CD is the result...some poets did their "homework" * others did not. All in all it was a MAGNIFICENTLY entertaining conclusion to a fine festival.